I have been added to the database Contemporary Authors, published by the Gale Company. https://www.gale.com/c/contemporary-authors-online. It is a listing of over 112,000 international writers and artists. “A Game Called Dead” 2016. A Runner-up in the 2016 Shelf Unbound Indie Book Award Contest. “The Weight of Living” 2017. Awarded FIRST PLACE FOR MYSTERIES in the 2017 Royal Dragonfly Books Awards; named a NOTABLE 100 BOOK in the 2018 Shelf Unbound Indie Book Awards; named a DISTINGUISHED FAVORITE in the 2018 Independent Press Awards; named a DISTINGUISHED FAVORITE in the 2018 Big NYC Book Contest. The books are published by Imzadi Publishing of Tulsa, Ok. I have been writing most of my whole life. I wrote short stories and bad poetry has a teen-ager. Then my first novel at 22 and another at 24. The first one needs work. 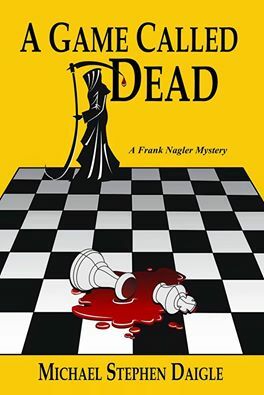 The second one became the start of the Frank Nagler mystery series, now into the third book, published by Imzadi Publishing of Tulsa. I was a print journalist for many years, starting at weekly newspapers in Massachusetts and Maine, and then dailies, in Maine and New Jersey. I learned how to write at newspapers. There is nothing more focusing than writing 800 words on a 45-minute deadline, nor anything as exciting as responding to breaking news, planning the coverage in an instant and seeing the plan come together as talented colleagues perform their craft. Follow me also on Twitter @50eagle50. The Greater Lehigh Valley Writers Group. and Mystery Writers of America. “The Weight of Living,” the third Frank Nagler mystery, was released April 25, 2017 by Imzadi Publishing. It is an intense thriller that has Detective Frank Nagler facing a ruthless killer with a long history of graphic crimes. Summary: A young girl is found in a grocery store Dumpster on a cold March night wearing just shorts and a tank top. She does not speak to either Ironton, N.J. Detective Frank Nagler, the social worker called to the scene, or later to a nun, who is an old friend of Nagler’s. What appears to be a routine search for the girl’s family turns into a generational hell that drags Nagler into an examination of a decades old “suicide” of a young girl, and the multi-state crime enterprise of the shadow ringmaster. “A Game Called Dead,” the sequel to “The Swamps of Jersey,” was released by Imzadi Publishing (www.imzadipublishing.com) on Jan. 7, 2016. “A Game Called Dead” was a runner-up in the Shelf Unbound Media 2016 Best Indie Book contest. “The Swamps of Jersey” is about political corruption and I attempted to write it in real time, that is to say, reflecting some of the activities that mark our present lives, but use them in a story that is broad and wide, and with luck, filled with the lives of characters struggling to make sense of troubled times. 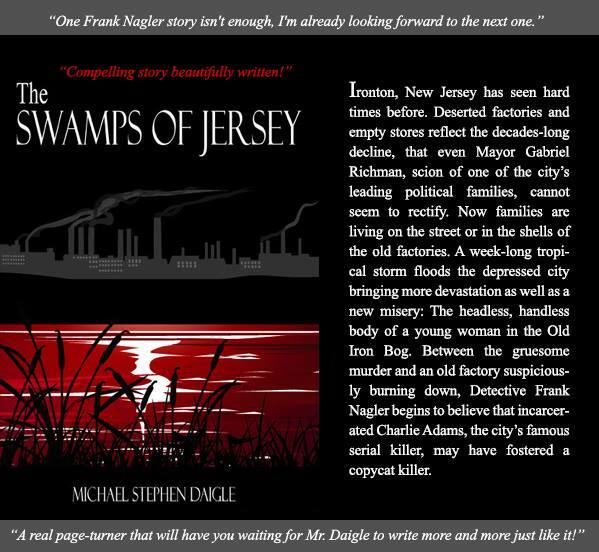 If you follow the news and have read about the “Bridgegate” scandal in New Jersey, “Swamps” contains elements and relationships that help explain the politics behind that story. The central character is Frank Nagler, a cop, whose troubled heart is ever present. Nagler is called out on stormy night to investigate the report of a dead woman in the Old Iron Bog. It is the first event in a chain of events that set the hard-luck city of Ironton, N.J. on edge. Besides the possible murder, the city was flooded when a week-long storm settled in and wrecked homes, businesses, and streets, and Nagler is trying to make sense of a series of letters that claim to expose theft of city funds, except they are so incomplete he wonders if it is really so. Then there is Lauren Fox, a woman sent to Ironton to jump-start economic development. She and Nagler are attracted to one another and begin to become serious when she leaves town without an explanation. Nagler was an emotional recluse following the death of his wife years before. They had been childhood sweethearts, and her death crushed Nagler. One, is a prequel to the series, taking place 20 or so years ahead of “The Swamps of Jersey.” It examines in detail the Charlie Adams serial murders that brought Frank Nagler unwanted fame as a detective, and the death of his wife, Martha, the event that sinks him into a long depressive state. The story is a battle between the pain that the death causes and the need to be the lead investigator in the murders. He is pulled into the public light just at the time that he wants to withdraw. The working title is “THE RED HAND,” which is a symbol the killer leaves at the crime scenes. “The Year the World Came to Mount Jensen, Maine” (working title). Nola Jensen, the sole heir to the estate left by her family, founders of the town of Mount Jensen, Maine, returns after many years during which she was on the run for her role in a Boston hold-up in which a police officer was killed. Tired of hiding and dragging her teen-age daughter from town to town, Nola seeks peace and reconciliation. What she finds is a small town torn by conflict. New residents from out of state want to turn the rural, lake front town into a version of what they left behind and the natives are resisting. There are fights over land, water and reconstruction that take many forms. At the center of the story are Nola and her collection of friends she left behind. Chief among them are Henderson, who owns the local diner, “Tender” Johnson, who works in a local paper mill, Dennis LeGrange, a deputy sheriff, and Oswald Neggerson, a poor farmer whose family, he claims, was defrauded by Nola’s family centuries before. When Nola and her daughter return to Mount Jensen, it is to witness Oswald pointing a rifle at Henderson in front of his diner. It is a story of cultures clashing, disputes in any form that are as old as the hills and as new as plans for change. It is a story about friendship and love and family, a story about generations: Nola’s daughter Emma and a local boy, Max, are both caught up in the adult events and their own explorations. It is also a story about the clash of ideas as Nola and Oswald face off. I see this story as a broad grand tale. “Three Rivers,” is the working title for a story about Smitty, the kid shortstop from my short story, “The Summer of the Home Run.” So far, the story involves Smitty, a self-described “knock-around kid,” his troubled best friend, Danny, and his beautiful, talented girlfriend, Katina. It’s about growing up, loneliness, finding adventure and discovers love that sticks. It’s sort of a Huck Finn kind of story. “Somerset” Hadley Chandler is the editor of a local weekly newspaper in Somerset, Maine. One day a local landowner shows him a series of photos taken of some of his forest land. In the last set of photos, the trees are dying and the land is eroding. That begins a tale that centers on industrial pollution, environmental terrorism and the impact on the town of Somerset and its residents. It is both a slice-of-life story that gives Chandler an opportunity to be the center of the action, and a modern story of spying, stolen land and broken trust. “Welcome to Gokey Manor.” A coming-of-age about Stephen Gardner and his co-tenants of a boarding home, including an Army veteran, a teen-age runaway, students and some young adults working away from home for the first time. This story was written years ago and needs an update, but the basic story hold together. I have had four shorter works recorded by talented voice artist Diane Havens as part of a monthly promotional effort. These are available for listening through my website. The short link is http://wp.me/1mc2c. Diane has suggested that if I complete a third story with a woman as chief character, it would make a compelling audio collection of stories. I am working on such a story. Harajuku design could be the name regarding road fashion trends that will leave the Harajuku Train station area within Tokyo, Asia. The free form, inventive design is actually preferred among teenagers and also young adults in the area. Due to its freeform character, Harajuku design is difficult in order to outline. It might be regarded contemporary, depending anime or even manga persona styles and also overthetop love. Follow these steps to dress within Harajuku design. Thanks for taking the time to stop by and read. M Daigle. I go to see daily a few blogs and websites to read articles or reviews, but this blog presents quality based writing. so I only use world wide web for that purpose, and get the hottest news. Thanks for taking the time to rad the site. Keep reading! Amazing work on this particular post. I simply tweeted it to all of my followers and look forward to other posts with this topic! Thanks for reading…I suggest you upgrade you anti-virus software…I don’t write online…I write on my laptop and store and backup files there and on portable harddrives…Once a piece is read for posting, I copy it to my website and never post the original. Aw, this was an incredibly nice post. Spending some time and actual effort to generate a very good article� but what can I say� I put things off a lot and don’t seem to get anything done. Thanks for reading… I understand…it is easy to get lost in procrastination. garcinia cambogia extract dr oz video part 2 It’s not that I want to replicate your web-site, but I really like the style. Could you tell me which design are you using? by the sincerness communicated in the article I browsed. And on this article About | Michael Stephen Daigle. An outstanding share! I’ve just forwarded this onto a colleague who has been conducting a little research on this. And he actually ordered me breakfast simply because I stumbled upon it for him… lol. So allow me to reword this…. Thank YOU for the meal!! But yeah, thanx for spending the time to talk about this issue here on your site. Thanks for reading. All the posts on this site are my own original work, both fiction and commentary. I’m really enjoying the theme/design of your blog. Do you ever run into any web browser compatibility problems? A number of my blog readers have complained about my website not operating correctly in Explorer but looks great in Opera. Do you have any recommendations to help fix this issue? I’ve got some suggestions for your blog you might be interested in hearing. Either way, great site and I look forward to seeing it develop over time. Good web site you have got here.. It’s difficult to find high-quality writing like yours nowadays. I seriously appreciate people like you! Take care!! I simply want to say I’m beginner to blogging and absolutely savored this blog site. Very likely I’m want to bookmark your site . You certainly come with fantastic articles. Kudos for sharing your blog. Tremendous things here. I’m very happy to look your article. Thanks so much and I am looking forward to contact you. Will you please drop me a mail? Wow, fantastic blog layout! How long have you been blogging for? you made blogging look easy. The overall look of your site is wonderful, let alone the content!. Thanks For Your article about About | Michael Stephen Daigle . Wow, awesome blog layout! How long have you been blogging for? you made blogging look easy. The overall look of your web site is excellent, let alone the content!. Thanks For Your article about About | Michael Stephen Daigle . Keep up the good piece of work, I read few blog posts on this site and I think that your site is very interesting and contains lots of good info. Whats up very nice blog!! Man .. Excellent .. Wonderful .. I will bookmark your blog and take the feeds additionallyЎKI’m happy to seek out a lot of useful info here within the publish, we want develop more strategies in this regard, thank you for sharing. . . . . .
Having read this I believed it was very enlightening. I appreciate you spending some time and energy to put this informative article together. I once again find myself personally spending way too much time both reading and leaving comments. But so what, it was still worthwhile. I just want to say I am all new to blogging and definitely enjoyed this web page. Most likely I’m planning to bookmark your blog post . You certainly come with very good posts. With thanks for sharing with us your website. Good ЎV I should definitely pronounce, impressed with your site. I had no trouble navigating through all the tabs as well as related info ended up being truly easy to do to access. I recently found what I hoped for before you know it in the least. Quite unusual. Is likely to appreciate it for those who add forums or something, site theme . a tones way for your client to communicate. Excellent task..
Hello there, I found your internet site after i was looking Bling for web sites connected to this content material. I planned to inform you, your site is sweet. I like the style far too, its great. I haven’t got the time now to completely browse your internet site but I have bookmarked it and that i also signed up for your personal RSS feed. I will be again in a very day or two. Many thanks for a excellent website. Hello, you used to write fantastic, but the last several posts have been kinda boringЎK I miss your tremendous writings. Past few posts are just a bit out of track! come on! I wanted to develop a small note to say thanks to you for all of the superb ways you are giving here. My extensive internet search has at the end been recognized with reasonable facts and strategies to go over with my classmates and friends. I ‘d declare that we site visitors are undoubtedly fortunate to live in a very good community with very many marvellous individuals with great tips and hints. I feel extremely lucky to have seen the web pages and look forward to some more thrilling moments reading here. Thank you once again for everything. Hello it’s me, I am also visiting this web site regularly, this website is truly good and the viewers are actually sharing good thoughts. Wohh just what I was searching for, thanks for posting . “Talent develops in tranquillity, character in the full current of human life.” by Johann Wolfgang von Goethe. After looking at a few of the blog articles on your site, I seriously like your technique of blogging. I added it to my bookmark webpage list and will be checking back in the near future. Please visit my web site too and let me know how you feel. You’ve got shared the most effective collection ever. “Sleek Minimal PSD Website” is definitely an incredible PSD. I simply want to say I am very new to blogging and site-building and seriously enjoyed your page. Most likely I’m likely to bookmark your blog . You amazingly come with great stories. Cheers for revealing your website. I just additional this site to my google reader, superb stuff. Cannot get enough! A digit of first-rate insight and on a subject I was merely mentioning to my partner. Show gratitude you for summarizing this area accordingly well. Ok so I think you made some good points there. I did a search on the issue and found mainly persons will go along with with your views. Apnateprly this is what the esteemed Willis was talkin’ ’bout. A fascinating discussion is worth comment. I believe that you should publish more about this subject matter, it might not be a taboo subject but usually people do not talk about such topics. To the next! All the best. I just want to tell you that I’m all new to blogs and certainly loved this web site. More than likely I’m likely to bookmark your site . You definitely have awesome articles. Bless you for revealing your website page. Hi there! First, I’d like to thank you for the helpfull details I studied from your blog. With this type of info you show, it has to be on the first page of each major search engines so people can learn it readily. Sad to say, this is not the situation. If I may advise, that you use this easy plugin on your wordpress blog to make your blog better in the search engines so people like me are able to get to your site easily take a look at http://goo.gl/qMIOF just send me email if you’d like any kind of help with the plugin. Appreciate it! I like this post. Best read inside a very long time. I hope that you will continue write such as this! When I first saw this title About | Michael Stephen Daigle on google I just whent and bookmark it. After study a couple of of the weblog posts on your web site now, and I really like your way of blogging. I bookmarked it to my bookmark web site record and will probably be checking back soon. Pls check out my website as effectively and let me know what you think. Great blog you’ve got here.. It’s difficult to find high quality writing like yours nowadays. I really appreciate people like you! Take care!! I simply want to tell you that I am just all new to blogging and site-building and actually enjoyed your blog. More than likely I’m going to bookmark your website . You actually come with really good article content. Cheers for sharing with us your blog. Hello, I discovered your site when i was hunting Bling for sites related to this information. I planned to notify you, your web site is sweet. I just like the style and design way too, its good. I haven’t got time now to totally go through your website but I have bookmarked it and i also signed up to your RSS feed. I will be again inside of a day or two. Thanks for a terrific internet site. Shirleysorbello.com has nominated you for a Liebster Award . Go to http://shirleysorbello.com/blog/ for the “rules” and to snag the badge to post on your website. Hi and thanks. This is WordPress theme that I modified a little. I suggest you pick a theme and change is necessaryu. Good luck. Does your site have a contact page? I’m having problems locating it but, I’d like to send you an e-mail. I’ve got some ideas for your blog you might be interested in hearing. Either way, great site and I look forward to seeing it expand over time. Have you ever thought about publishing an e-book or guest authoring on other sites? I have a blog based upon on the same subjects you discuss and would love to have you share some stories/information. I know my audience would enjoy your work. If you’re even remotely interested, feel free to shoot me an e mail. Have you ever thought about publishing an e-book or guest authoring on other sites? I have a blog based upon on the same information you discuss and would love to have you share some stories/information. I know my subscribers would appreciate your work. If you’re even remotely interested, feel free to shoot me an e-mail. I appreciate your wordpress web template, exactly where did you down load it from? I just added this weblog to my google reader, great stuff. Can not get enough! I feel that it is best to write extra on this matter About | Michael Stephen Daigle. It may not be a taboo topic but usually individuals are not sufficient to talk on such topics. With havin so much content do you ever run into any problems of plagorism or copyright violation? My blog has a lot of unique content I’ve either written myself or outsourced but it seems a lot of it is popping it up all over the internet without my authorization. Do you know any techniques to help protect against content from being ripped off? I’d genuinely appreciate it. Awesome posting in About | Michael Stephen Daigle. I liked reading this article. If you like, please visit my website. Wonderful article, I will bookmark About | Michael Stephen Daigle. About | Michael Stephen Daigle was saved as a favorite :), I like your site!